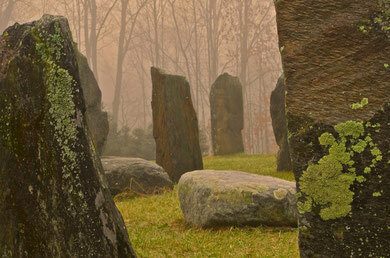 Click on the photo to see more images of the Stone Circle at Distant Hill. In 1979, my wife Kathy and I bought 21 acres of land in southwestern New Hampshire. The property, on a knoll once known as Distant Hill, is located five miles from the Connecticut River, in the hills above the town of Walpole. We spent over ten years building our house and multiple outbuildings, along with a vegetable garden, a swimming pond and hundreds of feet of stonewalls. We planted dozens of Christmas tree seedlings and brought an abandoned eight acre sugarbush back into maple syrup production. Work in the woods, thinning trees for the health of the forest, takes place every winter. The first ornamental gardens were planted in 1990, in what was an old hay field belonging to the original farm. 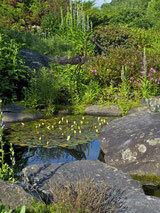 New gardens are still being created almost every year. What started as a hobby has blossomed into a love for the land and for the beauty that can develop when humans and Nature join together. Distant Hill, a certified Tree Farm, now encompasses 58 contiguous acres, 37 acres in the town of Walpole, and 21 acres in the town of Alstead. In 1790, Samuel Morrison (b.1752 - d.1833) bought a 100 acre lot in the hills of Walpole, New Hampshire, on a knoll known as Distant Hill, for the sum of￡125. The Morrison family slowly transformed what was once wilderness into a homestead and farm. The property remained a working farm until about 1970, and was subdivided and sold in 1978. Distant Hill Gardens contains the Morrison's old sugarbush (sugar maple orchard), 4 acres of cleared pasture, and 25 acres of woodland from the original farm. The old farm house, built circa 1793, is still standing just south of the gardens on March Hill Road. In 1773, Samuel Slade bought one of the original lots in Alstead, New Hampshire. The entire town had been divided into equal sized rectangular lots in 1763; most of the lots were “250 rods long and 160 rods wide, a total of 250 acres ...exclusive of highways”. This 250 acre piece included the 21 acres of forest land which is now the eastern part of Distant Hill Gardens. Many of the first farms in this part of New Hampshire were in the rocky hills outside of the towns. Although the soils were much better in the valleys, many settlers feared the 'bad air' (malaria), which they felt was more prevalent at the lower elevations.